What is the Nokia Morph about? Nokia Morph is a joint nanotechnology concept, developed by Nokia Research Center (NRC) and the University of Cambridge (UK). The Morph demonstrates how future mobile devices might be stretchable and flexible, allowing the user to transform their mobile devices into radically different shapes. It demonstrates the ultimate functionality that nanotechnology might be capable of delivering: flexible materials, transparent electronics and self-cleaning surfaces. • Flexible & Changing Design: Nanotechnology enables materials and components that are flexible, stretchable, transparent and remarkably strong. Fibril proteins are woven into a three dimensional mesh that reinforces thin elastic structures. Using the same principle behind spider silk, this elasticity enables the device to literally change shapes and configure itself to adapt to the task at hand. A folded design would fit easily in a pocket and could lend itself ergonomically to being used as a traditional handset. 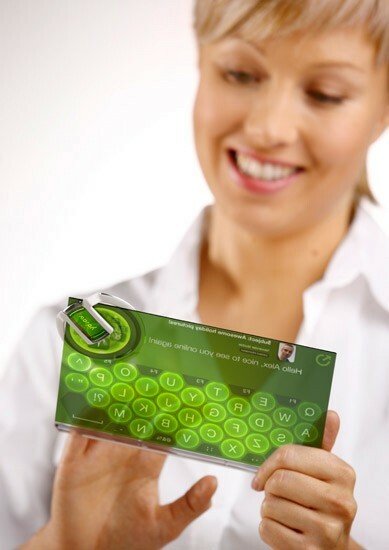 An unfolded larger design could display more detailed information, and incorporate input devices such as keyboards and touch pads. Even integrated electronics, from interconnects to sensors, could share these flexible properties. Further, utilization of biodegradable materials might make production and recycling of devices easier and ecologically friendly. **• Self-Cleaning: **Nanotechnology also can be leveraged to create self-cleaning surfaces on mobile devices, ultimately reducing corrosion, wear and improving longevity. Nanostructured surfaces, such as “Nanoflowers” naturally repel water, dirt, and even fingerprints utilizing effects also seen in natural systems. **• Advanced Power Sources: **Nanotechnology holds out the possibility that the surface of a device will become a natural source of energy via a covering of “Nanograss” structures that harvest solar power. At the same time new high energy density storage materials allow batteries to become smaller and thinner, while also quicker to recharge and able to endure more charging cycles. **• Sensing The Environment: **Nanosensors would empower users to examine the environment around them in completely new ways, from analyzing air pollution, to gaining insight into bio-chemical traces and processes. New capabilities might be as complex as helping us monitor evolving conditions in the quality of our surroundings, or as simple as knowing if the fruit we are about to enjoy should be washed before we eat it. Our ability to tune into our environment in these ways can help us make key decisions that guide our daily actions and ultimately can enhance our health. How feasible is the technology? In addition to the above mentioned advantages, the integrated electronics shown in the Morph concept could cost less and include more functionality in a much smaller space, even as interfaces are simplified and usability is enhanced. All of these new capabilities will unleash new applications and services that will allow us to communicate and interact in unprecedented ways. Elements of Morph might be available in the market to integrate into handheld devices within 7 years, though initially only at the high-end. However, nanotechnology may one day lead to low cost manufacturing solutions, and offers the possibility of integrating complex functionality at a low price. Is Nokia working on more such phones/technology? Nokia Research Center is working on technology up to seven years in the future and creating concepts that challenge conventional practices and spark new innovations.